MavenBird Technologies integration with market places, empowers brick-and-mortar stores to sell products on global marketplaces more efficiently. Eliminate manual entry to Amazon and eBay, no more copy pasting, manage all your products in one place. MavenBird Technologies integration automatically synchronizes inventory across all marketplaces and physical locations, increasing both customer satisfaction, Amazon rankings and delivers better operational efficiency, reducing management costs and increasing profit margins. MavenBird Technologies integration with marketplaces such as Amazon and eBay, empowers brick-and-mortar stores to sell their products on web stores and in global marketplaces more efficiently and improve rankings. MavenBird Technologies integration automatically synchronizes inventory across all marketplaces and phyical locations, increasing customer satisfaction and delivering better operational efficiency to the merchant. This, in turn, results in reduced management costs and higher profit margins. Channel integration mechanizes the listing process of merchandise across the online marketplaces. Our cloud platform connects and syncs data from the systems you already own. MavenBird Technologies integration helps online retailers in automating the pricing process of the items so that merchants keep pricing competitive across multiple marketplaces. We simplify multichannel sales for business selling through brick-and-mortar and online stores. 24Channel is an easy to use, cloud-based platform that links a merchant’s existing webstore, POS system and back office applications with market places. We enable multiple solutions to work together, optimizing inventory, streamlining operations and reducing man power. 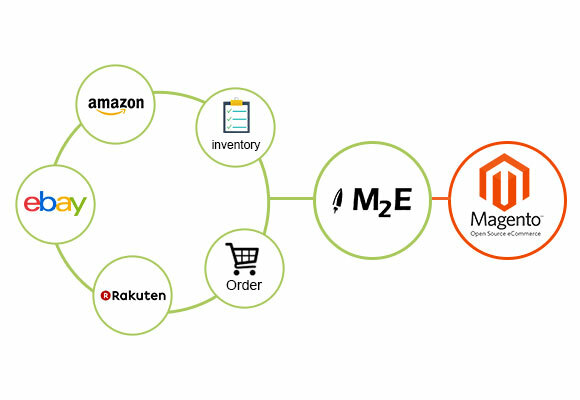 M2E Pro is an extension of Magento, which allows you to integrate your eCommerce website (built on Magento) to marketplaces like eBay, Amazon and Rakuten. So, instead of login-in to individual marketplaces to manage your product inventories and sales, you can manage directly from Magento backend and process your orders. We understand how important it is to have a centralize inventory system or dashboard that you can use to manage all your marketplaces. With eBay Ninja’s M2E Pro Integration services, you would be able to list and manage your products directly from Magento backend to marketplaces like eBay, Amazon and Rakuten. Learn more about M2E Pro and benefits you can have with our services. Additionally, advance customization of M2E Pro also allows you to specify the different product inventory for each marketplace. So, you can allocate the different product quantity as per the performance of each marketplace. Furthermore, if any of the products sold out on eBay or Amazon, you can specify rule to decrease the product quantity automatically from Main website inventory as well. Creating a list of customers is good habit for future engagement & promotion. With M2E PRO, you can import important information like customer email address and other necessary info into Magento. Later you can integrate this customer list into Mailchimp or other email marketing software to send them promotional emails. Furthermore, you can also perform important tasks like notifying customers of shipping tracking no, any delay on product delivery and carry out other important communication. This all leads to development of great product & higher customer satisfaction. Creating professional template is time consuming and requires good knowledge of HTML. With use of M2E Pro Custom template, you can create great looking professional listing for each marketplace individually. Previously, if you wanted to have a professional product listing, either you may have to create a custom HTML pages or you may have to use third party listing tools like Turbo Lister, Channel Advisor, Auctiva etc. All you need to do is to design a your choice of listing template and ask us to integrate that template into product description field. If you have been selling on ebay or Amazon, you may know that sellers need to have product description field where they specify additional information about each product for buyers. Each marketplace has its own rules and regulation. With M2E Pro, you can create custom product description for each marketplace. Furthermore, you can directly import important product attributes of specific product from Magneto backend. So, you need to create a description template only once and all product data will be fetched from Magento backend automatically while listing on marketplace. Price of your product plays an important role selling on marketplaces. As eBay and Amazon both charges certain percentage of final sales, it becomes mandatory for sellers to list a product with price that covers marketplace commission and other charges related to strict shipping and money back policy of marketplaces. With M2E Pro, you can specify rules to increase or decrease the actual product price based on certain predefined formula. So, you can always have a full control on product pricing for each marketplace based on the charges they charge to you.